Another Judge in the Dauphin County Court of Common Pleas has entered an Order requiring a Defendant to produce, prior to the Plaintiff’s deposition, all social media information gathered on the Plaintiff. This Order was entered by Judge Bruce F. Bratton of the Dauphin County Court of Common Pleas in the case of Vinson v. Jackson, No. 2015-CV-05150-CV (C.P. Dauph. Co. Aug. 23, 2016 Bratton, J.). The court did otherwise also rule that the Defendant was not required to produce any surveillance video taken by the Defendant’s investigators until after the Plaintiff’s deposition. In this regard, the court cited Dominick v. Hanson, 753 A.2d 824 (Pa. Super. 2000). 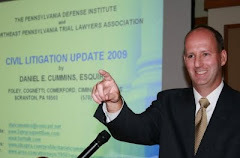 Click this LINK to view the Tort Talk post on the other Dauphin County Court of Common Pleas case in this regard issued by Judge Dowling.